I developed CmapTools' icon set, logo (see above), splash screen plus other visuals related to the promotion of the project. I designed the "look-and-feel" and developed GUI guidelines for CmapTools software that could work visually in the three main operating systems: Windows, Mac OS X, and Linux. These were applied to the design of windows, dialogs, alert boxes and icons. The guidelines provide visual descriptions with little text, so they can be easily accessed by the project programmers. Download CmapTools to see the design in action. 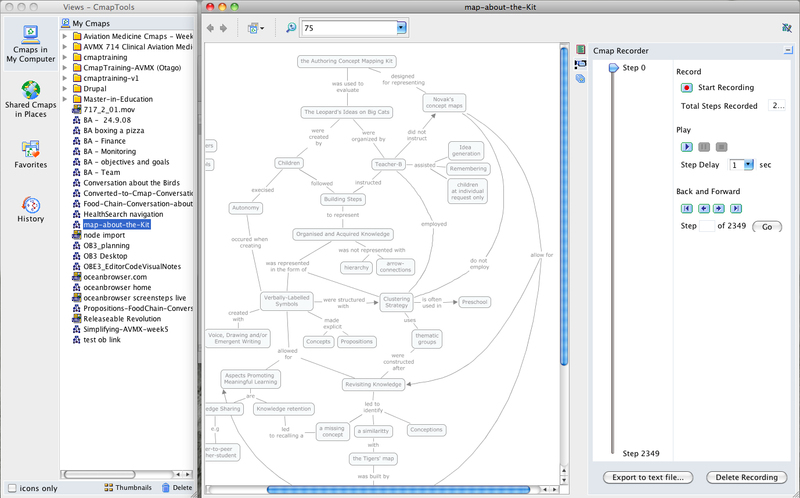 A. J. Cañas, G. Hill, R. Carff, N. Suri, J. Lott, T. Eskridge, G. Gómez, M. Arroyo, R. Carvajal (2004) CmapTools: A Knowledge Modeling and Sharing Environment In: Concept Maps: Theory, Methodology, Technology, Proceedings of the First International Conference on Concept Mapping, A.J. Cañas, J.D. Novak, and F.M. González, Editors, Universidad Pública de Navarra: Pamplona, Spain. p. 125-133.